Ice Age 2: The Meltdown, an English movie, is not currently screening in Hyderabad. Ok - once we ALL establish the fact that The Incredibles had only ONE segment of joke (count it - ONE) in its entire movie - which was basically the last 5 mins of it, this movie looks a hell of a lot funnier! 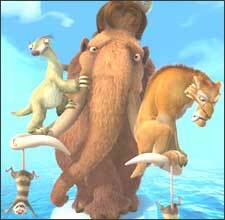 If you like Ice Age, you will like Part 2. If you liked The Incredibles - you need some lessons in comedy (class or cheap, alike). Rare is the sequel that actually outdoes the original in terms of performance, originality and sheer competence. And Ice Age 2 isn't one of them. The entire gang's back: Manny (Ray Romano), the all-knowing woolly mammoth; Diego (Denis Leary), the snobby sabre-toothed tiger; Sid (John Leguizamo), the giant sloth who's a catastrophe-waiting-to-happen; and the ultimate show stealer, Skrat - the squirrel who's crazy about his nuts. fullhyd.com has 700,000+ monthly visits. Tell Hyderabad what you feel about Ice Age 2: The Meltdown, and then also see all user reviews for Ice Age 2: The Meltdown!